The Madhya Pradesh government today ordered an inquiry into complaints of farmers, who were in for a shock, after seeing the amount marked against their names under the farm loan waiver scheme. NDTV had reported the case studies done around rural areas of Bhopal, where two farmers from Agar Malwa village, couldn't believe their eyes, when they saw Rs 13 against their names. 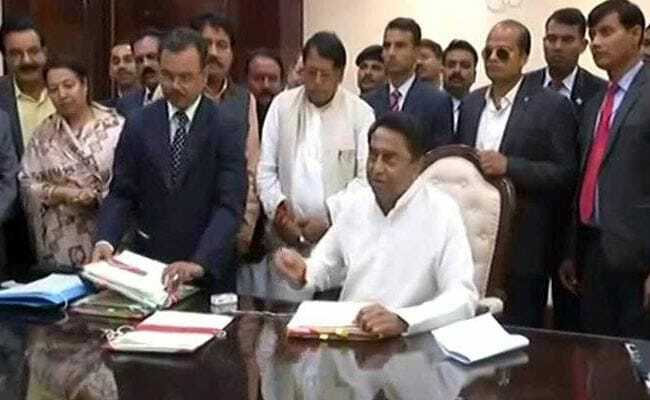 Chief Minister Kamal Nath, who is in Davos, has asked his officials to immediately look into complaints of the farmers. Control rooms have been set up at the district level to address concerns of the farmers under the Jai Kisan Fasal Rinn Mafi Yojana. The state government has formed a panel of officers, who would look into the matter and respond to the complainants within two days. Chief Minister Kamal Nath has asked district collectors to take strict action against those responsible for the irregularities. The Congress government in Madhya Pradesh had announced loan waiver of up to Rs 2 lakh soon after taking charge. Over 31 lakh farmers have submitted their loan-waiver applications in gram panchayats till Wednesday. Applications for loan-waiver will be received from farmers till February 5. Farmers even from the Chief Minister's constituency, found their names against amount as low as Rs 13 or Rs 232, instead of the Rs 2 lakh as promised. Adding to the confusion is the list of the nationalised banks printed in English, which the farmers are unable to read. Bank officials claim that they don't have a Hindi software. "Our software is in English only, which we have to give at the branch level," said Roshan Kumar, manager, Canara Bank. The government said these are technical errors and will be rectified soon. "Under this scheme, over 55 lakh farmers are going to benefit. These cases are related to technical and human error and will be taken care of," agriculture minister Sachin Yadav told NDTV. The BJP criticised the Kamal Nath government, saying the farmers will teach the Congress party a lesson in the Lok Sabha elections. "I am afraid most of the farmers will be cheated; they are even saying they don't need the loan-waiver certificate as it's of no use. Farmers will teach them a lesson in the Lok Sabha elections," said opposition leader Gopal Bhargava.